looks with shelves full of BOOKS! There is something really amazing that happens when many, many people all have similar ideas at the same time, Carl Jung coined the amazing word: Synchronicity. Synchronicity is simply a marvelous, meaningful coincidence. Months ago we met the wonderful Kristen Talaga, Marketing and Communications Manager at Traverse Area District Library. We recall our original meeting had to do with dreaming and scheming, but our subsequent meetings have been all about library support. During one of these meetings we realized that both Traverse Area District Library and BFWP were working on the same thing: building small community libraries. And our calendars proved even more more synchronicity: we'd even planned little library festivities in the same week --we believe Carl Jung is smiling somewhere. It seems the whole world is getting excited about little libraries, they are popping up everywhere! Yesterday we witnessed as the first of many Little Free Libraries was dedicated to the wonder-filled community of Traverse City. There were balloons, smiles, hugs, official ribbon cutting, photos taken, and happy patrons browsing new collection. When the hubbub died down there the little library remained; waiting for the next patron to open its doors and "Take a Book, Leave a Book" as the library urges all who visit to do. 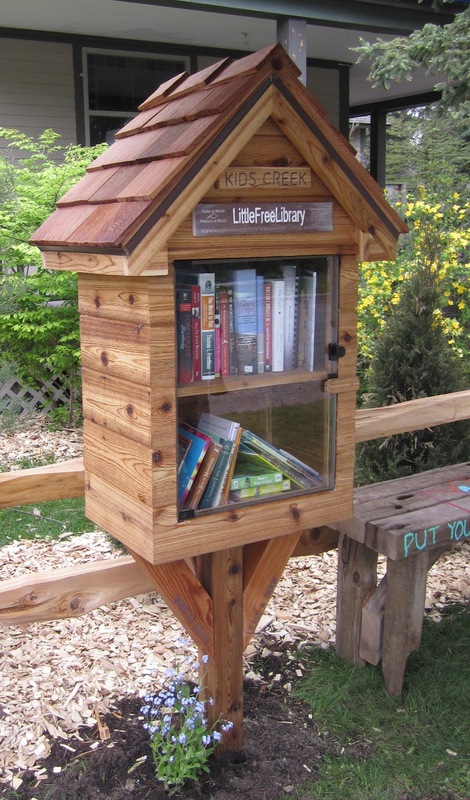 Search "Little Free Library" and prepare to be inspired! And of course follow along with Books for Walls Project as we complete our own small library, we'll share photos, details and goodies along the way. Are you interested in a small library for your community? Contact us tell us what you are thinking. --that would be a lovely world indeed! I LOVE THIS IDEA!!! It is brilliant. and inspiring!! I've been absent for a while so I'm missing all the fun! This is great! Why havn't I heard anything about it before? Are the local papers covering it? If not, they should be!!! Well, the Record Eagle did their piece! But there could always be more, and we do need more good news in the world don't we!?! Want to write about it!?! Next week we have an installation in Traverse City and soon ours will be ready! If you are on Facebook check out our up to the minute goodies... we'll message people interested in getting involved locally! https://www.facebook.com/TheBooksforWallsProject or as always send us an email! Great to see you here again! Enjoy all this amazing sunshine!